The Madres of disappeared Central American migrants wear the photos of their missing sons and daughters and chant: “¡vivos se fueron, vivos los queremos!” The grieving women, the photos, and the chants are a cluster of traumatic memes that convey the ongoing nature of disappearance as political practice. Like the Madres of Plaza de Mayo almost fifty years before them, the Madres’ mobilization of traumatic memes underlines the durational and globalized nature of protest as a response to continuous and globalized criminal practices. 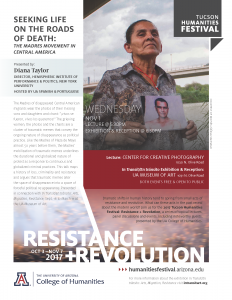 This talk maps a history of loss, criminality, and resistance and argues that the traumatic memes alter the space of disappearance into a space of forceful political re-appearance. 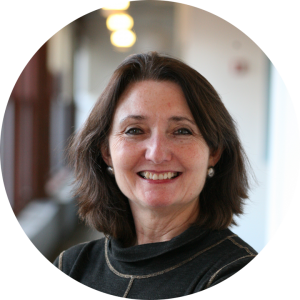 Diana Taylor is University Professor and Professor of Performance Studies and Spanish at NYU, and the 2017 President of the Modern Language Association. She is the author of Theatre of Crisis: Drama and Politics in Latin America (1991), which won the Best Book Award given by New England Council on Latin American Studies and Honorable Mention in the Joe E. Callaway Prize for the Best Book on Drama; ofDisappearing Acts: Spectacles of Gender and Nationalism in Argentina's 'Dirty War', Duke U.P., 1997; and The Archive and the Repertoire: Performing Cultural Memory in the Americas (Duke U.P., 2003), which won the ATHE Research Award in Theatre Practice and Pedagogy and the Modern Language Association Katherine Singer Kovacs Prize for the best book in Latin American and Spanish Literatures and Culture (2004). The Archive and the Repertoire has been translated into Portuguese by Eliana Lourenço de Lima Reis (Belo Horizonte, Brazil: Universidade Federal de Minas Gerais 2012) and Spanish by Anabelle Contreras (Santiago de Chile: Ediciones Universidad Alberto Hurtado, 2015.) She published PERFORMANCE (Buenos Aires: Asuntos Impresos, 2012), a new revised version in English with Duke U.P. 2016; and Acciones de memoria: Performance, historia, y trauma, Peru: Fondo Editorial de la Asamblea Nacional de Rectores (2012). She is co-editor of Estudios avanzados de Performance (Mexico: Fondo de Cultura Económica, 2011), Stages of Conflict: A Reader in Latin American Theatre and Performance (Michigan U. P., 2008), Holy Terrors: Latin American Women Perform (Duke U.P.,2004), Defiant Acts/Actos Desafiantes: Four Plays by Diana Raznovich (Bucknell U. P., 2002),Negotiating Performance in Latin/o America: Gender, Sexuality and Theatricality (Duke U.P., 1994), and The Politics of Motherhood: Activists from Left to Right, (University Press of New England, 1997). She has edited five volumes of critical essays on Latin American, Latino, and Spanish playwrights, and several digital books such as What is Performance Studies (co-edited with Marcos Steuernagle) and Dancing with the Zapatistas (Duke U.P. 2016) Her articles on Latin American and Latino performance have appeared in journals such as PMLA, Profession, Critical Inquiry, TDR: The Drama Review, Theatre Journal, e-misférica, Performing Arts Journal, Latin American Theatre Review, Estreno, Gestos, Signs, MLQ and other scholarly journals. She has also been invited to participate in discussions on the role of new technologies in the arts and humanities in important conferences and commissions in the Americas (i.e. ACLS Commission on Cyberinfrastructure). Taylor is the recipient of the Guggenheim Fellowship in 2005, an ACLS Digital Innovation Fellowship, 2013-14. She is Vice President of the Modern Language Association (MLA) and will be President in 2017. Diana Taylor is founding Director of the Hemispheric Institute of Performance and Politics, funded by the Ford, Mellon, Rockefeller, Rockefeller Brothers and Henry Luce Foundations. *Free validated parking is available at the Main Gate Garage, located on 2nd Street and Euclid. Validation tickets will be provided to symposium attendees.